Welcome to the discussion thread for To Aru Kagaku no Railgun S, Episode 23. I really recommend watching it as it basically put together all the "less important" pieces of all previous episodes. PS: was that Gensei on phone with Kongo's father, or was that just my imagination? Last edited by zaeraal; 2013-09-20 at 10:50. Hooray for Touma putting such a huge influence on Mikoto with his quote: "Going back home laughing without losing anything is my dream"
TouMAN is the best that's why!!!! Komoe-sensei! Her house is still wrecked huh. They even managed to shoehorn Gensei into this mess. And is this him as well? And Nagai is getting revenge at Nishikiori for the Endymion movie huh. Saten and her freaking bat in action, with a helmet, Uiharu and cleaning robots against a whole army of heavy machines. Not to mention Konori all alone. Couldn't Wannai or Awatsuki come with her? They have enough firepower there with Kongou. Let's just get this over with next week. Good thing there's NT8 to wash this all off. So Mikoto did plan to just split up and injected herself with a tracking device in the off chance she needed rescuing... though she didn't and Kuroko came for nothing. And apparently its a tracking device they use on people who leave the city, has it been mentioned before anywhere [mod edit: in the Railgun anime] that they inject tracking nano devices when you take a trip outside? While 笑う can mean to laugh, it can also mean to smile which I'm pretty sure is more of the intent of that line. And you do see him smiling after the sisters arc is all over, don't think Touma usually laughs it off afterwards. ^As expected of Kamachi's filler lame villains . Albeit, not all of them are. So I wasn't the only one who saw that Endymion reference?! I'm also surprised with that cameo from Konori's roommate. On another note, I'm pretty sure that the one was talking to Kongou's dad was not Gensei, just some random old guy. As you can see a little earlier in the episode, Gensei is more ugly, with a face full of spots. 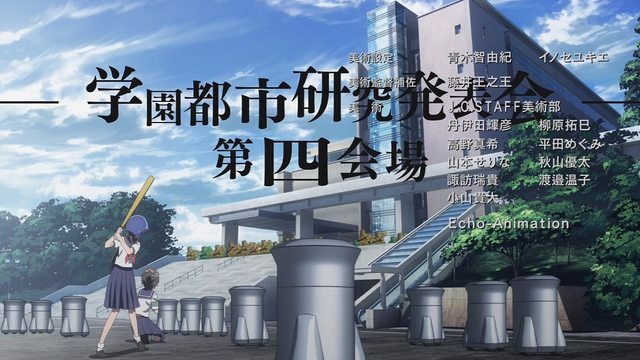 Incidentally, the kanji writing on the pic above says: "Kongou Airspace - Academy City Second Factory". Who needs rollercoasters or bungee jumping when you can have Biribiri carry you like a princess and emit sparkles all around you while she jumps off buildings? She only does it to people similar to her own build I guess? All those robot suits, wasted. The STUDY is causing revolution, for what? How can they expect everyone to understand by just skipping what is important in the first place? Nagai truly misunderstands what kind of person Mikoto is. She not just a level five only thinks that ability is everything. That was a very good episode. Kind of annoying that the villains plays his part in such a cliché manner and just gives his plans for no reason whatsoever, though. But at this point I'm even more confused about why Academy City has actually put effort into letting STUDY do what they want. Isn't STUDY going against Academy City? Maybe that's why ITEM is flailing about. She not just a level five only thinks that ability is everything. He probably meant she isn't a power hungry Level 5, for which psychic powers are everything. I think he is not satisfied with Mikoto's frontal approach with STUDY at the end of the episode. Aritomi: Hey how about I tell you key details of my plan for no reason? Misaka: How about you tell me this one specific thing? Aritomi: Don't be ridiculous, I'm not going to let you trick me into telling you my plan. By the way here's some more details of my plan. If STUDY is supposed to be a group of five students that no one pays any attention to, how the hell were they able to become Anti-Skills sole weapons provider? If they have enough political pull to let a terrorist attack happen without anyone trying to stop it why the hell do they claim to be ignored? If they have knowledge of the Parameter List, why don't they just release the info on that to start a revolution instead of this convoluted plan? 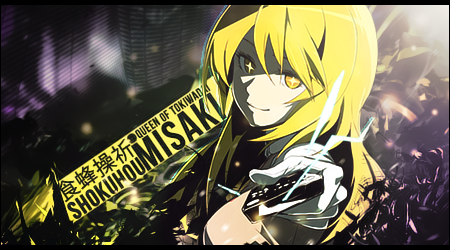 If Shinobu is their prisoner why were they having her vote on every decision they made? Maybe if they hadn't spent so many episodes on SoL they wouldn't have had to stuff an entire plot's worth of exposition into a single episode. Only good thing about this episode was Misaka revealing she could move her muscles with her power. This plot might have had some merit if it weren't for the awful villains and terrible plot holes. I'm really looking forward to next episode just so it will be over.